Highlight the best possible targets on your property quickly and to depth with DCIP (up to 750 m) & MT to 1500 m and beyond! Over 15 years of proven success! 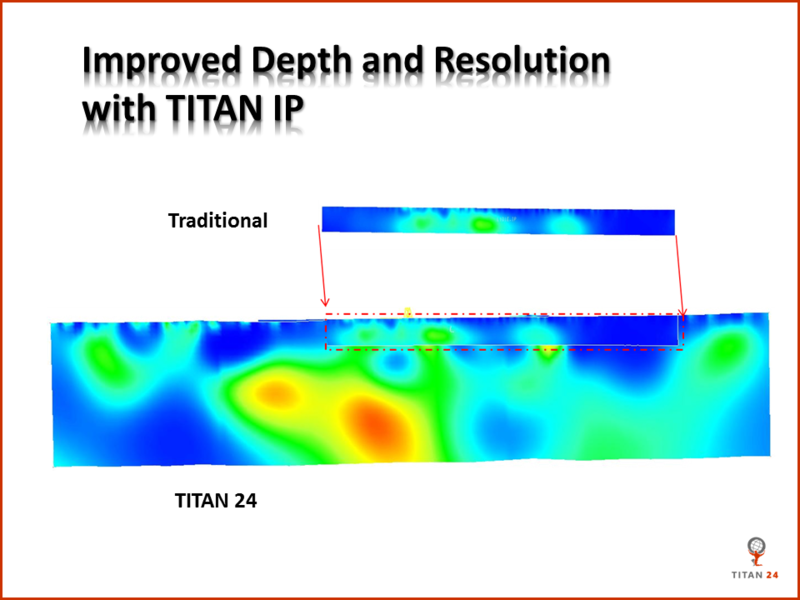 TITAN 24 surveys provide accurate 2D surface to depth imaging for drill planning. 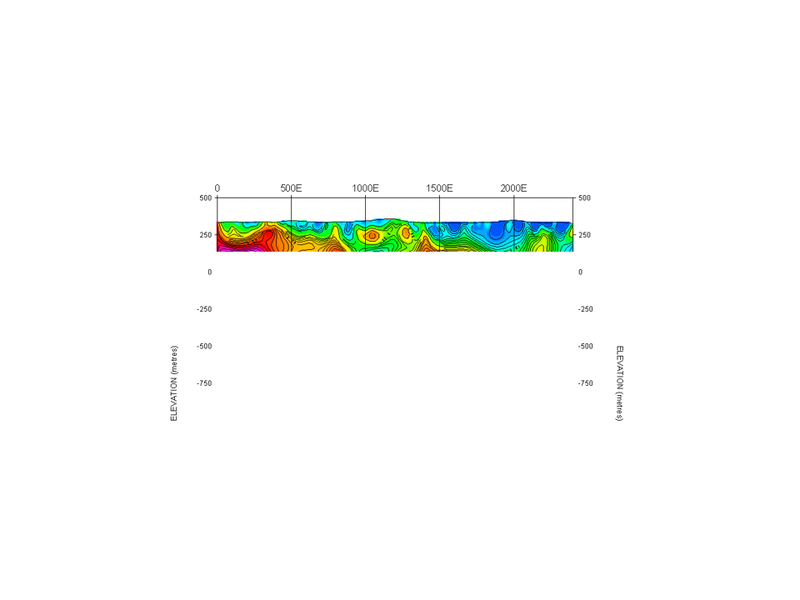 By imaging multi-parameters to depth you can reduce the number of drill holes required to test and explore the subsurface on your property. 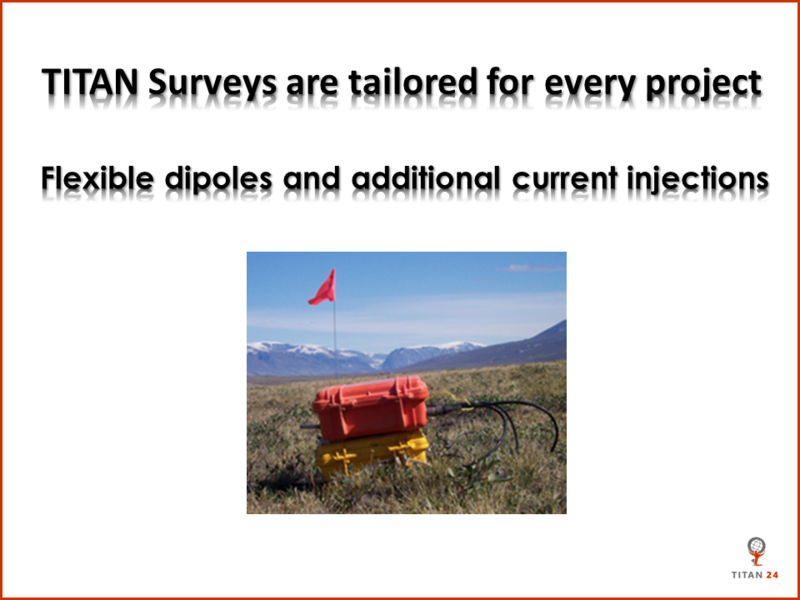 TITAN 24 is a distributed array-based geophysical system that collects two separate geophysical surveys; DCIP as well as Magnetotelluric (MT). 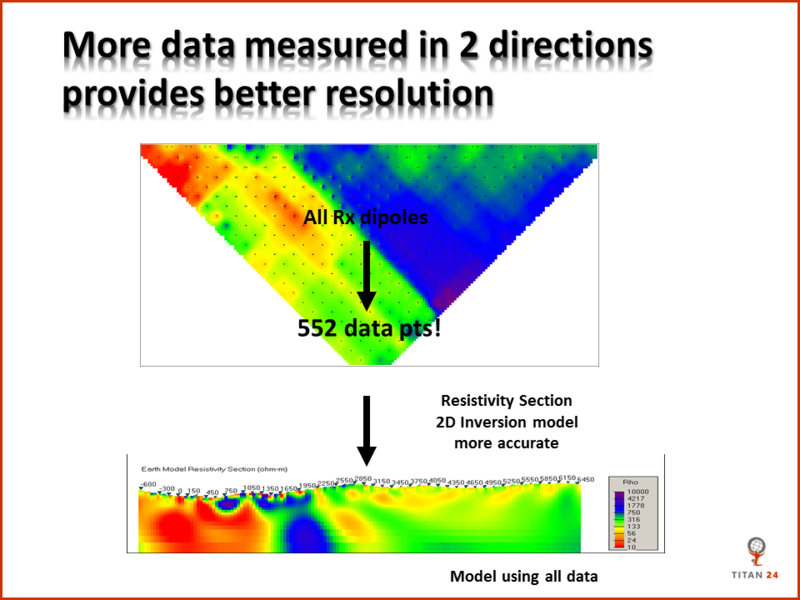 DCIP provides resistivity and chargeability sections and the MT provides a deeper resistivity section. TITAN 24 is unique for several reasons. 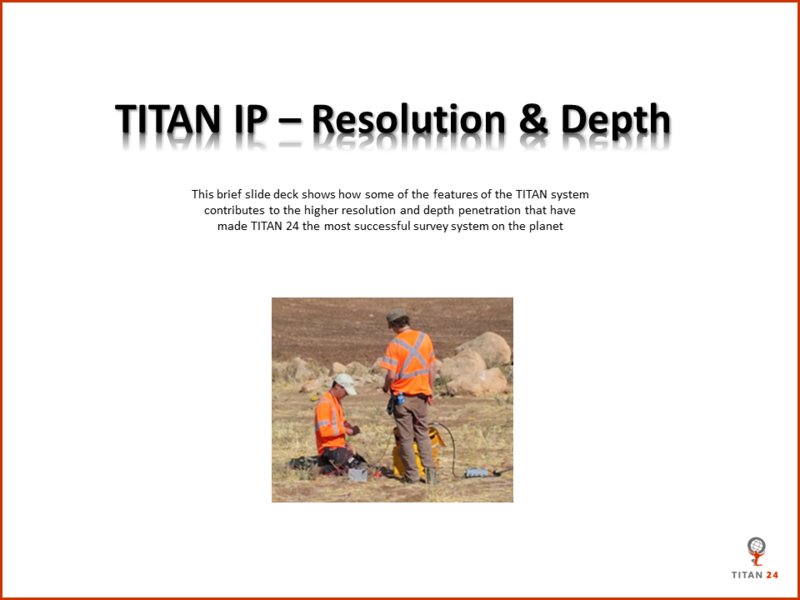 The technology behind TITAN allows the system to sample data very rapidly and measure very small signals. The DCIP data is typically and routinely collected to depths of 500 – 750 m and the MT data is collected to depths of 1500 m and greater. 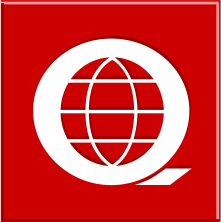 The survey system was introduced to the market in 2000 and has completed over 400 surveys globally including, over 60 minesite surveys. 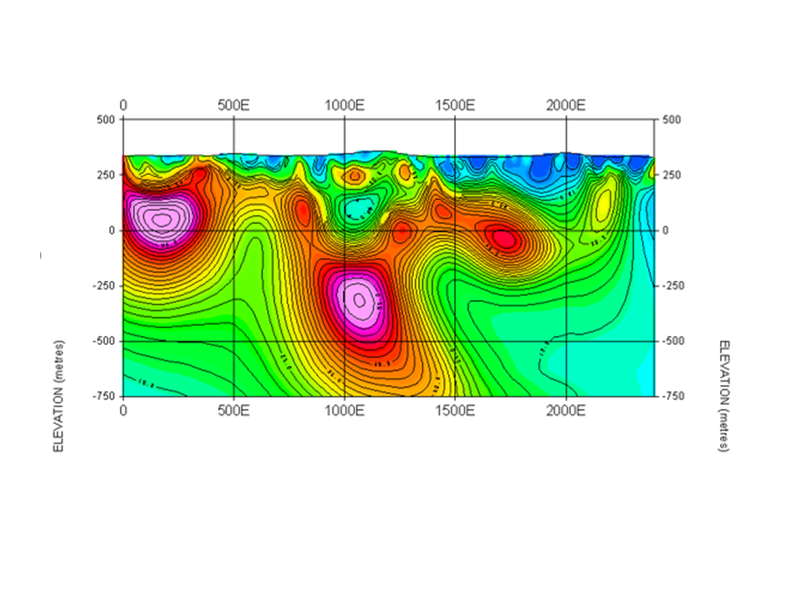 For more information on Magnetotelluric (MT) surveying please visit our REFERENCE page. A complete line of connected receivers (24 or more) is deployed in the field. 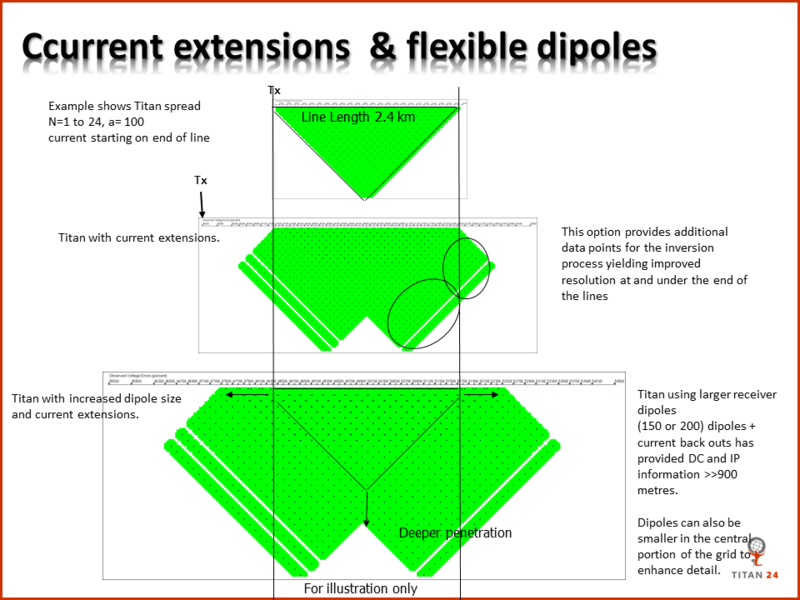 The line length can vary from 700 m to 5000 m depending on the dipole size used for the target and information desired. 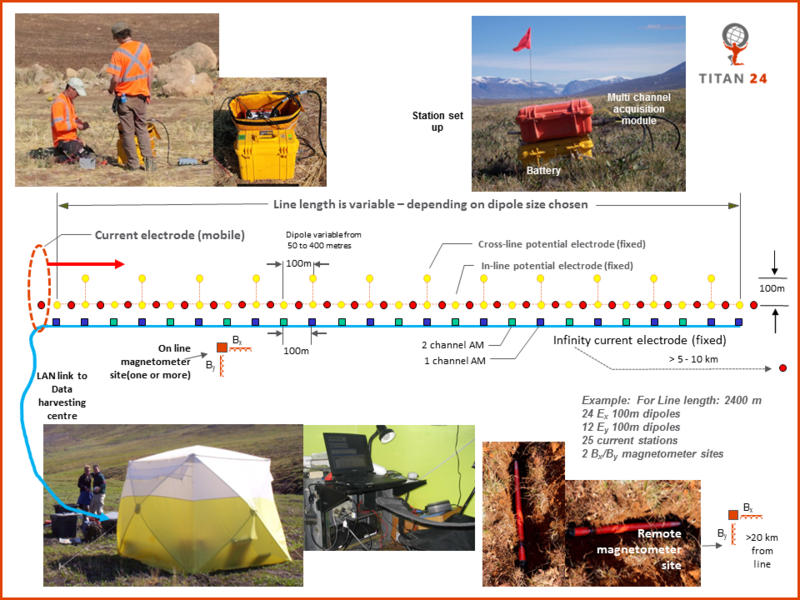 Typically in the day time an resistivity & induced polarization (DCIP) survey is executed and subsequently an MT survey is completed. If logistics are smooth, the MT is collected during the night. 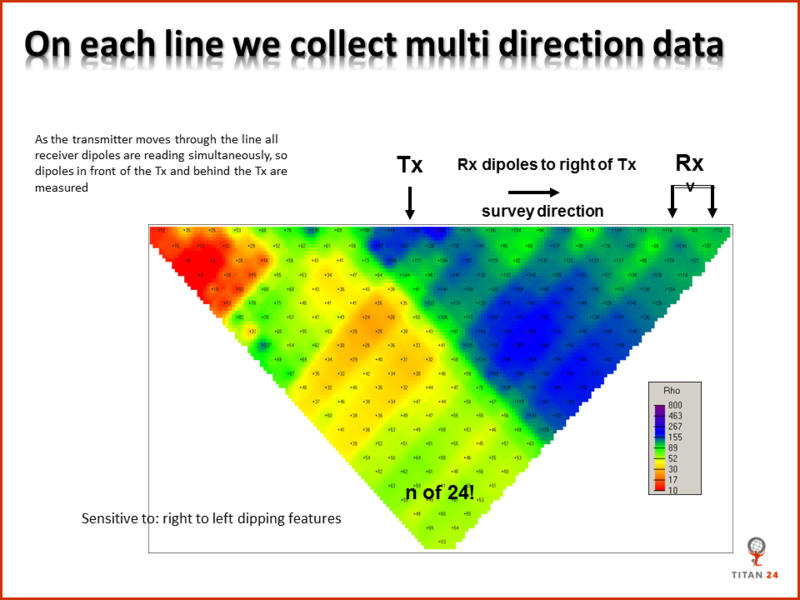 Both surveys are completed from one line set-up. Once the system is set up, the current is injected at one side of the survey. (see above left, red dashed ellipse). All of the 24 deployed dipoles simultaneously read the response. After that event is recorded the current is moved up to the next injection point and another reading is taken. This continues throughout the day until the current has reached the other end of the line. As the current moves through the line all dipoles are read , that is, both the ones in front of the injection and those behind. 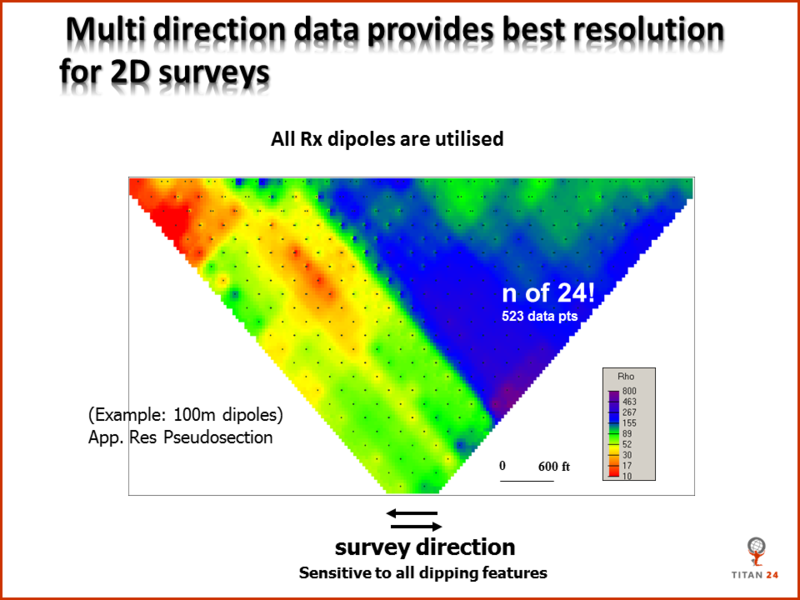 This is one of the many benefits of a 2D TITAN survey as both current leading and current lagging surveys are combined to produce the final result. 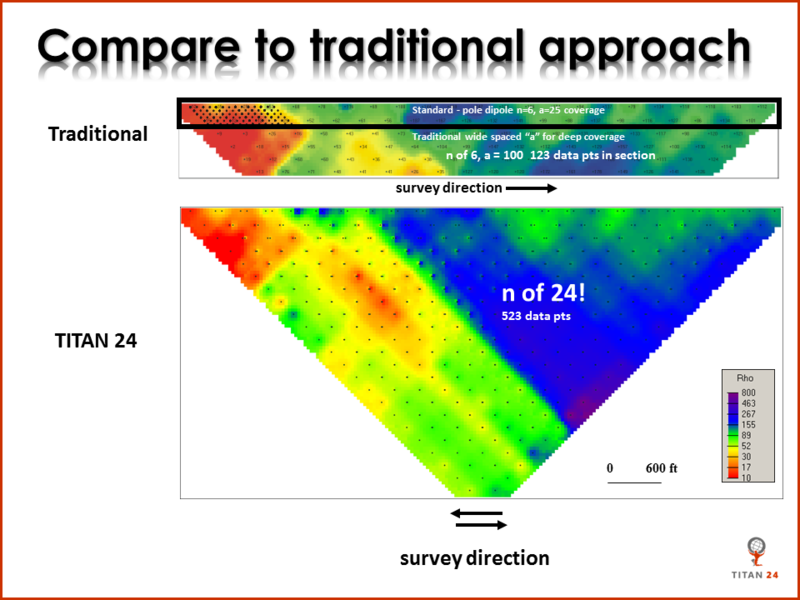 This bi-directional sampling helps eliminate biased responses that may occur with conventional methods. (see IP presentation below). Following the DCIP survey, the MT survey is then completed. The MT effectively measures 24 MT sites spaced 100 metres (typically). This provides very high resolution MT surveying, which is typically deployed at 500 m spacing or more. Consider TITAN 24 for your project. 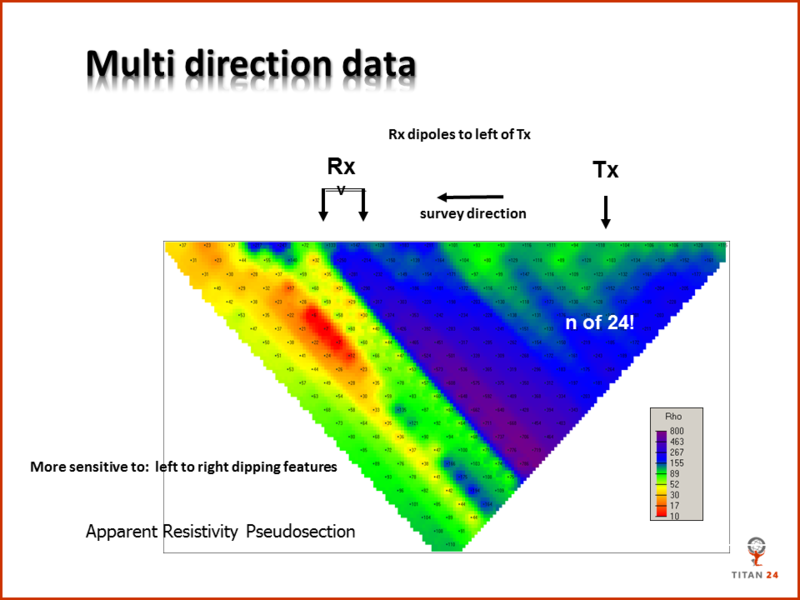 By exploiting the benefits of distributed and multi-parameter DCIP & MT data, obtain detailed information on resources, alteration, structure and geology leading to more cost-effective drill targeting near surface and up to depths of 1.5 km. 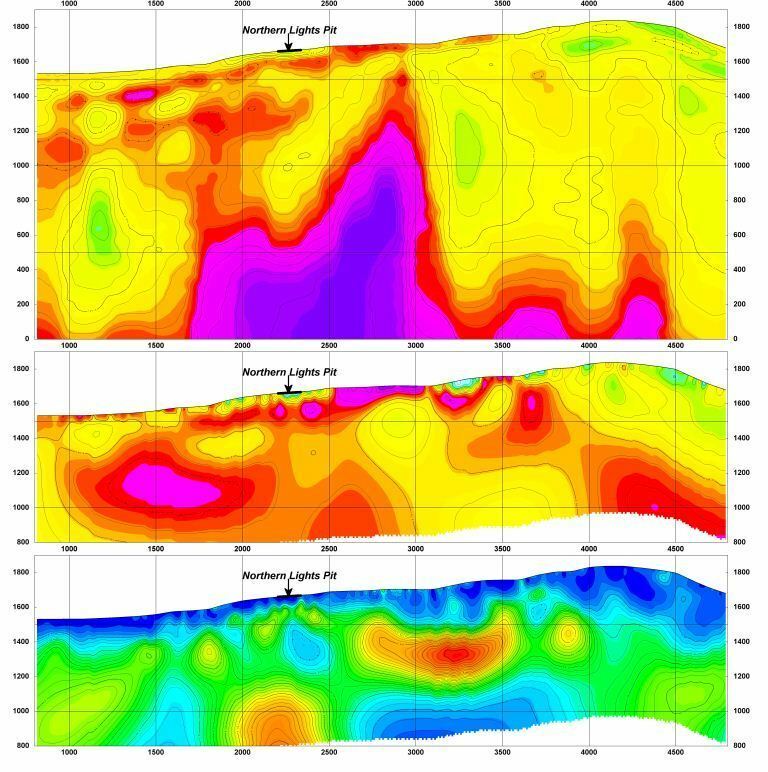 Quantec’s professional Geophysical experts custom design each survey to overcome the challenges of your site and to meet your project objectives. 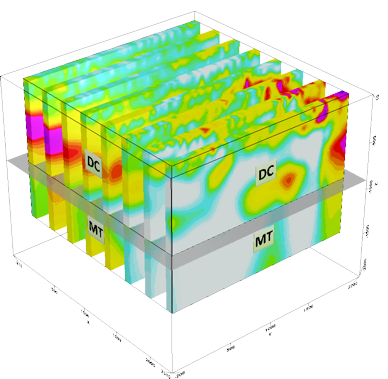 Each survey’s layout and design are structured to give you the best possible view of your resources on the surface and to depth. 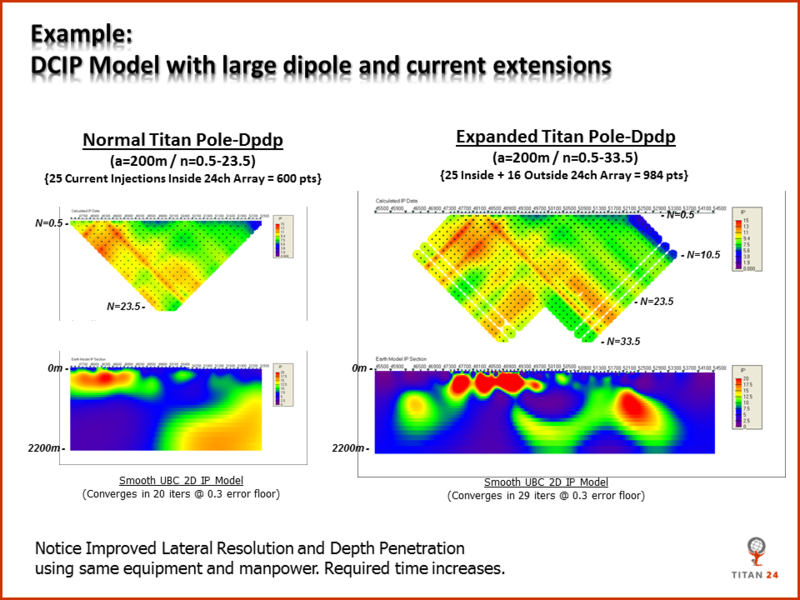 TITAN 24 is flexible and can be operated in MT or IP mode only, with dipole measurements from 25 m up to 400 m.